UNICEF/Giacomo Pirozzi | In 1996 in Rwanda, wooden crosses mark the graves in a cemetery in the village of Nyanza in a rural area of Kigali, the capital. During the 1994 genocide, over 10,000 people were burned to death in Nyanza as they tried to escape towards Burundi. 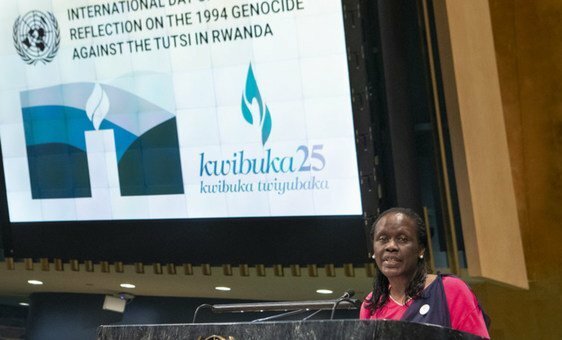 “Most of the survivors we have today were broken in their bodies and their souls”, Esther Mujawayo-Keiner told those gathered in the General Assembly Hall, to reflect on what UN chief António Guterres referred to as “one of the darkest chapters in recent human history”, which overwhelmingly targeted Tutsi, but also moderate Hutu and others who opposed the genocide. UN Photo/Eskinder Debebe | Esther Mujawayo-Keiner, survivor of the 1994 Genocide against the Tutsi in Rwanda, shares her story during the International Day of Reflection, 2019. She recounted how the genocide took almost all of her immediate family, including her parents, most of her siblings and her husband. She thought she might be the last woman left standing, “because it was almost impossible to survive”. But slowly, she discovered there were other widows – a new kind of family – adding that the “widows clan” helped her to be “truly alive” and no longer “dead on the inside”, and together with other female survivors, she founded the widows’ association AVEGA. “Today we stand in solidarity with the people of Rwanda”, Secretary-General Guterres told the gathering, calling on everyone present to acknowledge “dangerous trends of rising xenophobia, racism and intolerance” at work throughout the world today. Calling the current widespread proliferation of hate speech and incitement to violence “an affront to our values, which threatens “human rights, social stability and peace”, he saw them as the “dangerous trends” that were “clearly present in Rwanda immediately before the genocide”. 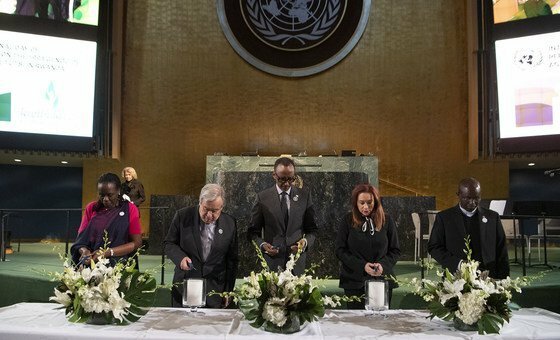 UN News/Elizabeth Scaffidi | UN Secretary-General António Guterres addresses the Commemoration of the International Day of Reflection on the 1994 Genocide against the Tutsi in Rwanda in the General Assembly Hall, April 2019. “Today’s commemoration gives us an opportunity to once again raise our voices against racism, xenophobia and related intolerance, including social and ethnic discrimination, anti-Muslim hatred and anti-Semitism”, the UN chief asserted. “Wherever they occur, these evils should be identified, confronted and stopped to prevent them leading, as they have in the past, to hate crimes and genocide”. “reject hate speech and discrimination”, and to root out the causes that “undermine social cohesion and create conditions for hatred and intolerance”. “Let us all pledge to work together to build a harmonious future for all people, everywhere” he said, calling it “the best way to honour those who lost their lives so tragically in Rwanda 25 years ago”. “Tutsi were decimated”, General Assembly President María Fernanda Espinosa stated. Beginning on 7 April 1994, “those [who] opposed the genocide, including Hutus, were also targeted and killed”. Putting the bloodshed into perspective, she said that “an average of over 8,000 people a day, more than 30 in the time allocated to this ceremony” were slaughtered. 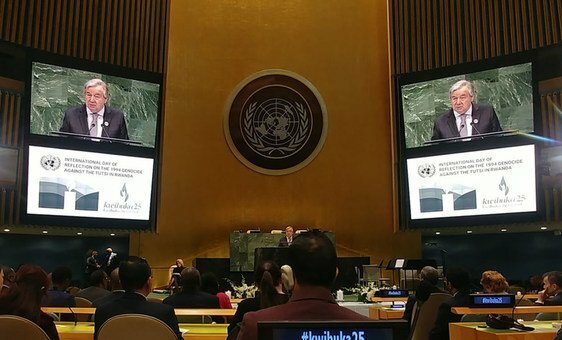 “The international community watched in horror, but we did not prevent the atrocities”, lamented Ms. Espinosa, asking those gathered to “rekindle our efforts to realize our promise of ‘never again’” by investing in education “to enshrine the lessons” of the past, fight hate speech and “call out those who dehumanize others”. Keynote speaker Rwandan President Paul Kagame attested to his country’s fighting spirit, of how it went from darkness to hope, and called honour and prevention acts of remembrance. “We honour the victims. We honour the courage of the survivors, and we honour the manner in which the Rwandans have come together to rebuild our nation” he asserted. Citing “denial and trivialization” as the foundation of genocide, Mr. Kagame stressed that “countering denial is essential for breaking the cycle and preventing any recurrence”. UN Photo/Eskinder Debebe | Lighting candles during the commemoration of the International Day of Reflection on the 1994 Genocide against the Tutsi in Rwanda. He pointed out that Rwanda has been among the top five UN peacekeeping contributors, explaining that his nation contributes soldiers and police, “with values instilled by our tragic history”. “As a nation once betrayed by the international community, we are determined to do our part to working with others to make things better going forward”, President Kagame concluded. For her part, Valentine Rugwabiza, Rwanda’s UN Ambassador, reflected on the time, 25 years ago, when “the world and the United Nations abandoned Rwanda”. She viewed the event underway in “this very house that let Rwanda down”, as a historic one and expressed gratitude that although her country had experienced “interrupted” peace and security, it is now on the solid foundation “of social cohesion”. “I was asked to provide a photo of my family”, said survivor Marcel Uwineza, a Jesuit priest. “I actually don’t have any”. He painted a picture of Hutus and Tutsis being pitted against each other, where “uncles turned against their nephews and nieces” and where his family “lost everything”. Reverend Uwineza underscored that the genocide “was born of racist policy rather than war”, as many claim. “We have to challenge the many deniers who use war as a means to minimize the gravity of the genocide, knowing that all lives matter, but a genocide is no crime like any other” he underlined. Speaking about the “joy of reconciliation”, the priest described meeting the man who killed his two brothers and sister, saying that he had initially thought he was going to be murdered as well. But instead, the man knelt before him and asked for forgiveness. “When finally I said ‘I forgive you’, I felt free”, Reverend Uwineza said.